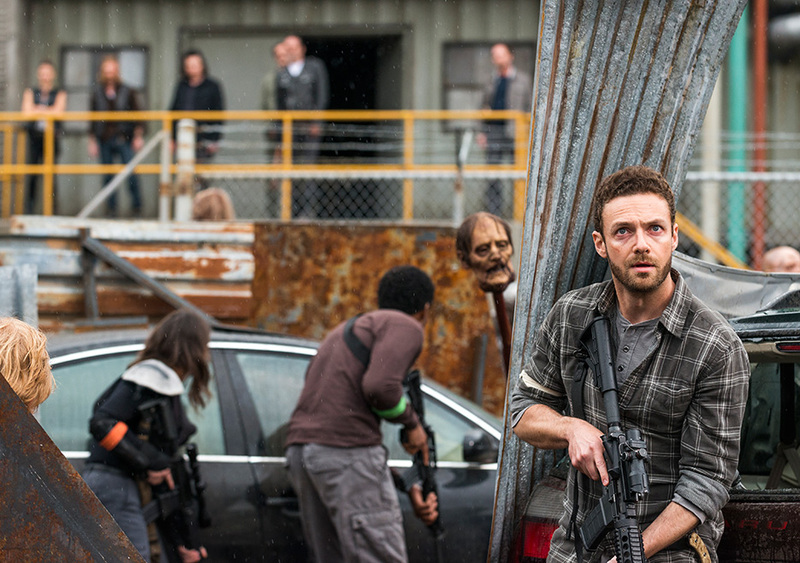 Aaron (Ross Marquand) in Episode 100. Photo by Gene Page/AMC. With the season premiere, “Mercy,” Rick’s Gang is ready to bring it to Negan and the Saviors, once and for all in Episode 100, but Showrunner Scott M. Gimple, Director Greg Nicotero and the rest of the filmmakers have other plans for the main characters in Season 8. Halloween’s almost here, so naturally TWD returns with all-new episodes. Carl yearns for hope in a world full of hopelessness; Dwight’s finally gotten with the program, giving up lookout locations of the Saviors. Hilltop and the Kingdom are finally working together for a common cause. “And on this day, we begin to reshape this world,” King Ezekiel foreshadows. Rick’s got some major tricks up his sleeves, but he’s ready to follow Maggie as the new leader, once Negan is finally dealt with. Three-fourths of this hour-long episode dealt with a TON of setup for the next episode (as well as the rest of the season). Unfortunately, there was not one major death of a main character, which was an incredible letdown for a milestone episode, as well as a season premiere. Father Gabriel feels sympathy for Gregory. Attempting to save him, he gets stranded when Gregory steals his battle-ready vehicle. Where were the trash hipsters of Oceanside during the firefight? Will Father Gabriel become a Sanctuary sacrifice? Will Gregory finally bite the bullet? We’ll find out soon enough, possibly in the next episode. And what’s the deal with Old Man Rick? Why is he listening to Weird Al during the Zombie Apocalypse? Or has it ended already? Is it true that Judith survives this storyline (or is that another daughter by Rick?)? Is this a flash forward? A dream sequence? Hopefully it’s something else! Please don’t turn TWD into a bad LOST clone! “I like to think that this is just the beginning,” stated Creator Robert Kirkman, on the super-sized Talking Dead, which actually felt more important than the episode, itself. Practically ever major character made an appearance in front of a live audience to celebrate the milestone. Fallen characters of Sasha, Hershel, Beth, T-Dog and Merle were celebrated with the appearances of Sonequa Martin-Green, Scott Wilson, Emily Kinney, IronE Singleton and Michael Rooker, respectively. There is also a killer crossover planned between Fear The Walking Dead and the mothership, TWD, taking place at some point in 2018. More details on that as they develop. Also noteworthy is Red Machete, the five-part digital series that aired during a commercial break. Part 1, “Day Four,” looks to depict the origin story of the red-handled killing machine previously seen in Season 5, which hacked up the cannibals of Terminus. It’s initially found in Gerald’s Hardware. This quickie series looks intriguing, in a Dead Rising sort of way. Looking forward to seeing where this one goes. It’s been a great run so far for The Walking Dead and hopefully it’ll get the necessary time to tell the whole story its filmmakers hope to depict. And here’s to hoping the filler episodes are far and fewer in between!